By Alejandro Rodriguez, for MSBLNational.comINDIO– Rich Hunter went 4-for-5 with seven RBI, while younger brother Dewey Hunter went the distance on the mound as the Murrieta Mutiny defeated the Ventura Dodgers 12-3 in the 35 Wood Bat American Division finals at the Desert Classic. The Mutiny scored eight runs in the first four innings of the game and Rich Hunter was at the center of most of the action. He stroked a three-run single in the four-run second inning, and his two-run double keyed a three-run rally in the fourth inning. The Dodgers finally got on the board with a run in the fifth, but the Mutiny answered with two runs in the sixth inning. They capped the scoring in the seventh inning when Rich Hunter singled in his sixth and seventh runs of the day. While the 39-year-old Hunter tortured the Dodgers with his bat, brother Dewey, 37, kept the Dodgers quiet on offense scattering three runs on nine hits over nine innings. Mutiny slugger Mark Pugal went 3-for-5 with three runs scored. 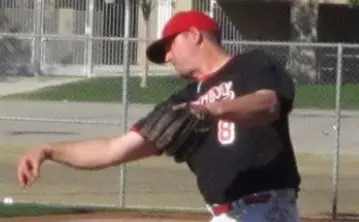 The Desert Classic title was the Mutiny’s first MSBL tournament title. Manager Brad Allinson was very impressed with his teams’ effort, particularly his pitching staff. “The middle of our lineup we feel is very strong,” Allinson said. “Our first seven hitters make for a very strong lineup, but overall we do it as a team. Everybody does their part,” he added. “Our pitching was terrific, in six games of this tournament we had five complete games, Dewey Hunter and Gary Adams each pitched two of them and Ed Tuer pitched the other, so we only had to use four pitchers, when you have that kind of pitching you’re going to do pretty well.” he said.